Check out each day of our Paddle Georgia journey as well as previews of our two campsites for the week by scrolling down! The following is a day by day blow of what to expect on Paddle Georgia 2019 as we journey some 92 miles on the Withlacoochee and Suwannee Rivers from Valdosta, Georgia to Mayo, Florida. Be sure to click on the links to learn more about the subjects in the daily descriptions! 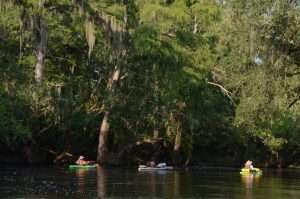 June 15 Troupville Trot: Approximately 11 miles from Troupville Boat Landing to near U.S. 84—The perfect introduction to deep south Georgia paddling, the journey actually begins on the Little River about 600 yards upstream from its confluence with the Withlacoochee. Troupville, situated in the fork of these joining rivers, in the 1830s was a bustling place in frontier Georgia, the seat of government for the recently formed Lowndes County. It was named in honor of Georgia Gov. George Troup. The people of Lowndes must have held the former governor (1823-1827) in high regard. They not only named Troupville in his honor; when the county seat was moved closer to the railroad in the late 1850s that community took the name Valdosta, honoring Troup again by borrowing the name of his plantation on the Oconee River near Dublin. From the confluence of the Little and Withlacoochee, the river winds through a wild and wooded landscape where moss-draped cypress and tupelo trees dominate the canopy and where limestone outcrops introduce surprising shoals. June 16 Okapilco Polka: Approximately 14 miles from near U.S. 84 to Clyattville Road—This run jogs past the mouth of Okapilco Creek, one of many lyrical Native American geographical place names that have endured the test of time. As it winds past this tributary, the Withlacoochee continues its path across long stretches of flat, blackwater that are interrupted occasionally by unexpected shoals. Dense stands of willow are common along the river’s low banks while bluffs rise occasionally on outside bends. Like Okapilco, the Withlacoochee retains its Native American name, and it appears, that like us, the area’s original inhabitants were not especially creative when it came to naming their local rivers. “Withlacoochee” translates to “little” or “big little.” In fact, there are two Withlacoochee rivers in Florida, as well as a nearby Willacoochee River. The other Withlacoochee flows through Central Florida. Likewise in Georgia, there are three Little rivers. The one that meets the Withlacoochee at Troupeville and two others in North Georgia. June 17 State Line Shag: Approximately 14 miles from Clyattville Road to Bellville Road—Here the Withlacoochee jumps into Florida, back into Georgia and finally into Florida for good. In the midst of a three-decade-long water dispute between Georgia and Florida over the use of water in the Chattahoochee River, the Withlacoochee reminds us that rivers know no boundaries. The shoals continue as the river jumps back and forth over the stateline and past the historic remains of the Valdosta Southern Railroad bridge. 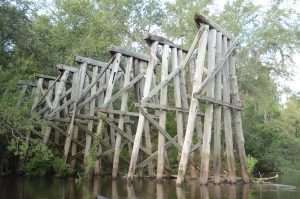 Dating to the early 1900s, this rail line was abandoned in the 1970s and today, on the Florida side of the river, the rail bed has been converted into the paved, multi-use Four Freedoms recreational trail, stretching from the river 12 miles to the town of Madison. With wetlands in abundance on either side of the river here, including some protected by the state of Florida, don’t be surprised to encounter the acrobatic swallow-tailed and Mississippi kites performing aerial stunts as they forage for food among the treetops. June 18 Madison Blue Springs Salsa: Approximately 12 miles from Bellville Road to Madison Boat Ramp—The geology of the region really shows off on this run. Pocked and pitted limestone bluffs that resemble Swiss cheese frequently rise along the river banks; the shoals continue and in one spot, you may even witness (depending on water levels) a place where the river literally disappears underground, a trick of the karst geology of the area. That same geology gives rise to springs that bubble up from the Floridan aquifer with breathtakingly beautiful results. Madison Blue Springs State Park, with a spring pool 85 feet wide and 25 feet deep, will highlight the day’s journey. Bring your snorkel and swim goggles! A dive in this crystal clear water will reveal an underwater world filled with fish and turtles luxuriating, like you, in this beauty spot. But wait, there’s more! 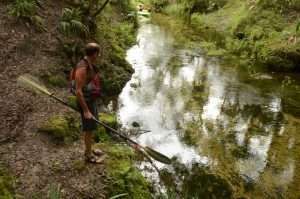 Hardee Spring and Pot Spring will offer cool respites from the heat as well. The “blue water” of each spring contrasts sharply with the blackwater of the river. June 19 Suwannacoochee Shuffle: Approximately 10 miles from Madison Boat Ramp to Suwannee River State Park—Our venture along the Withlacoochee comes to a close on this short run that ends with a 0.2-mile paddle upstream on the Suwannee River to Suwannee River State Park. But the springs, shoals and beauty continue! Morgan, Fairy, Corbett and Suwannacoochee springs all provide blue hole swimming breaks. 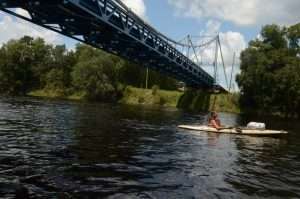 Riverfront homes become more common as the Withlacoochee nears its date with the Suwannee. The Withlacoochee’s blackwater pales in comparison to the Suwannee which has its origins within the Okefenokee Swamp. The difference is noticeable where the two rivers meet. June 20 Dowling Park Disco: Approximately 15 miles from Suwannee River State Park to Dowling Park Boat Ramp—The shoals of the Withlacoochee long gone, the Suwannee runs deep and wide through long stretches of state forest land on this paddle that ends just a mile from our Camp Suwannee campsite at Dowling Park. 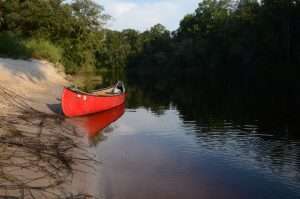 Highlights of the run include more springs, white sandbars, impressive limestone bluffs, historic bridges and a look at the Suwannee River Wilderness Trail’s top-notch campsites for paddlers. The sites feature covered and screened sleeping platforms, dining pavilions with lights and ceiling fans and even air-conditioned restrooms with showers and flush toilets. 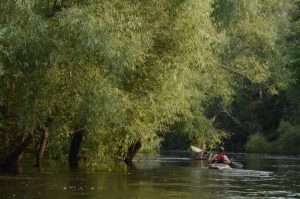 June 21 Lafayette Blue Springs Limbo: Approximately 15 miles from Dowling Park Boat Ramp to Hal Adams Bridge—The week goes out with a bang as we have a chance to dip our toes in Charles, Thomas, Lafayette Blue and Perry springs. Lafayette Blue Springs State Park is the gem of the four. 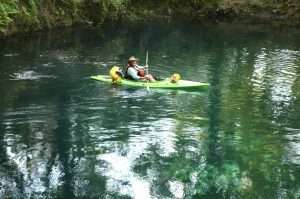 The first magnitude spring protected as a state park boils from the Floridan aquifer into a large spring pool before flowing beneath a natural limestone bridge and into the Suwannee. On river, if you are lucky, you may see the leap of massive gulf sturgeon. These ancient fish average about five feet in length and can reach weights of 170 pounds. They have the ability to jump more than seven feet out of the water. If you are unlucky, one of these giants might jump in your boat. In 2017, three people suffered minor injuries on the Suwannee when they were struck by leaping sturgeon! Grassy Pond Recreation Area June 14-18: This Moody Air Force Base Recreation Area sits on 500 acres adjacent to a beautiful 200-acre pond. 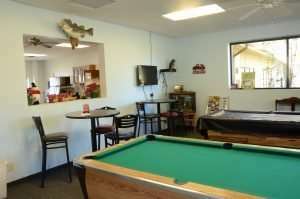 Accommodations include tent camping, RV sites with full hookups, rental cabins, screened picnic pavilions, campstore with snacks and beverages, wading pool, beach volleyball, playground and more. We’re finalizing the details with the campsite managers, but rest assured, we’ll have air-conditioned areas for you to beat the heat at the end of your day’s paddle. 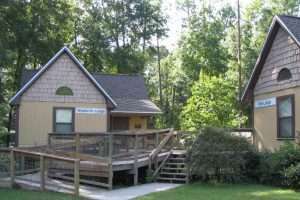 The facility’s cabins will be available for rent directly from Grassy Pond Recreation Area. We will also make available a limited number of spaces in cabins with beds and linens through our registration page. Before registering, you’ll want to decide if you want to tent camp, rent a cabin individually (or as a group) or reserve one of our spaces in cabins through your Paddle Georgia registration. Click here to visit the Grassy Pond Recreation Area website. 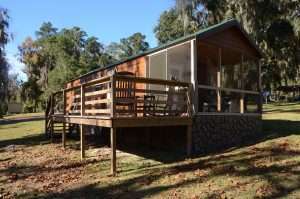 For cabin reservations, contact Grassy Pond at 229-559-5840. 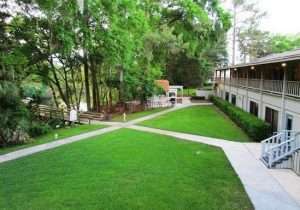 Camp Suwannee at Advent Christian Village June 18-22: This retirement community and summer camp facility offers tent camping, indoor “camping,” hostel-style bunkhouses, hotel rooms and multiple amenities within walking distance…all overlooking the Suwannee River. You’ll have the option of tent camping or indoor camping, or for a small additional fee, you can get a bed in one of the bunkhouses. Those wishing to reserve a bed in one of the hostel-style bunkhouse may do so through the Paddle Georgia registration page. 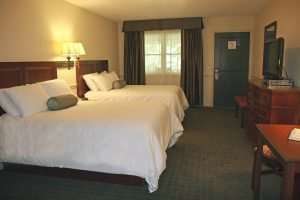 Participants may reserve hotel rooms directly through Camp Suwannee. 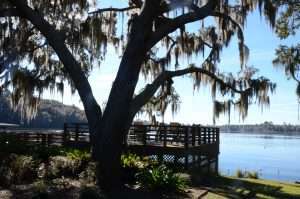 Click here to visit the Camp Suwannee website. To reserve a hotel room at the campsite, contact the Advent Christian Village at 386-658-5200 or 800-371-8381. Join Georgia Adopt-A-Stream on Paddle Georgia to assess the health of the river. During the trip, you can become certified as a Georgia Adopt-A-Stream citizen water monitor and assist the Adopt-A-Stream team with their week-long water monitoring program. 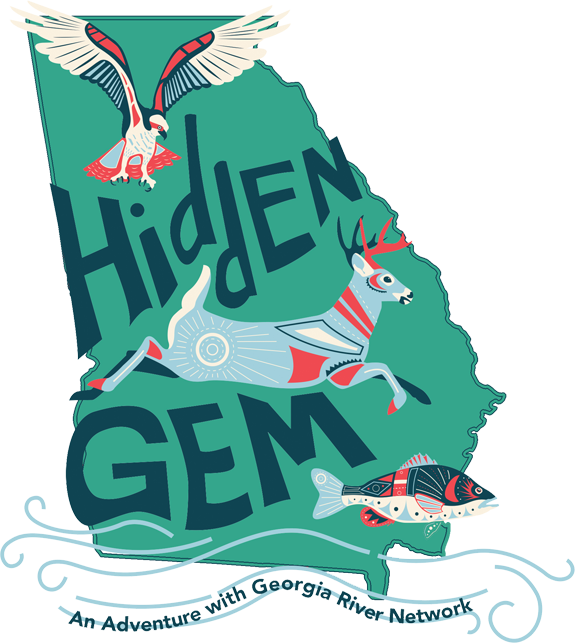 Click here to learn more about Georgia Adopt-A-Stream. If you are interested in becoming a certified citizen water monitor, be sure to indicate so when you register for Paddle Georgia!